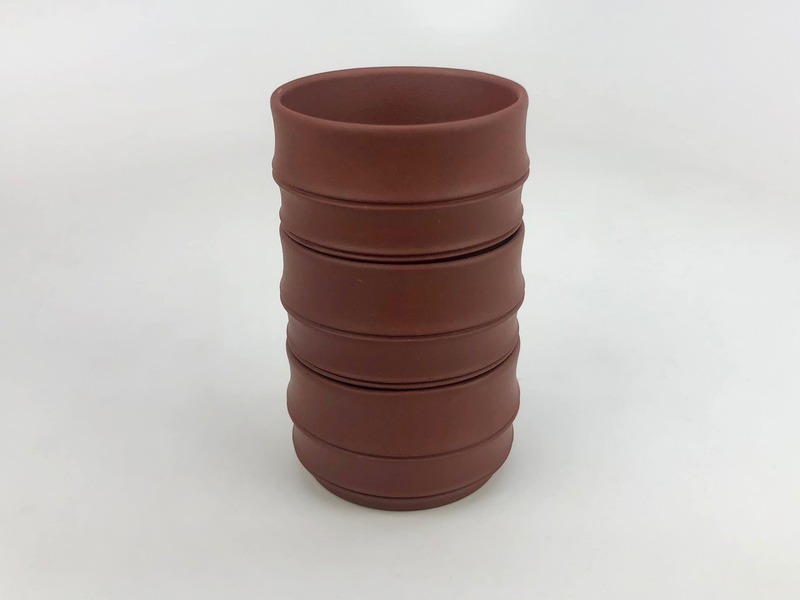 A small 70mL bamboo segment red yixing clay cup made from red Hong Ni yixing clay. The bamboo segment design is easy to hold. This bamboo segment red yixing clay cup is made of red Hong Ni yixing clay. Its textured bamboo joint shape makes it easy to hold. The image of bamboo is often associated with Chinese hermit scholars, who like to peacefully enjoy tea and music under the shade of bamboo forests. The segments of bamboo also symbolize moving up in life through hard work, growing higher from one segment to the next. These cups, with their nesting bamboo segment shape, can be stacked on top of each other to resemble a bamboo stalk. The Chinese like to use small drinking cups when sharing tea with their friends. This allows everyone to enjoy the way the tea’s flavor develops through each infusion. Taking time to sit down and slowly sip your tea infusion by infusion in small cups is a way to fully enjoy high quality tea. Small cups will cool down the temperature of the tea much faster so you can drink it sooner. When drinking tea for thirst, health benefits, or everyday consumption, the Chinese use large mugs or a pint glass to drink a larger amount of tea at a time.